Leave a Comment on Mediocre Manchester: Who will sing a song for Europe? Thursday nights at the Etihad? 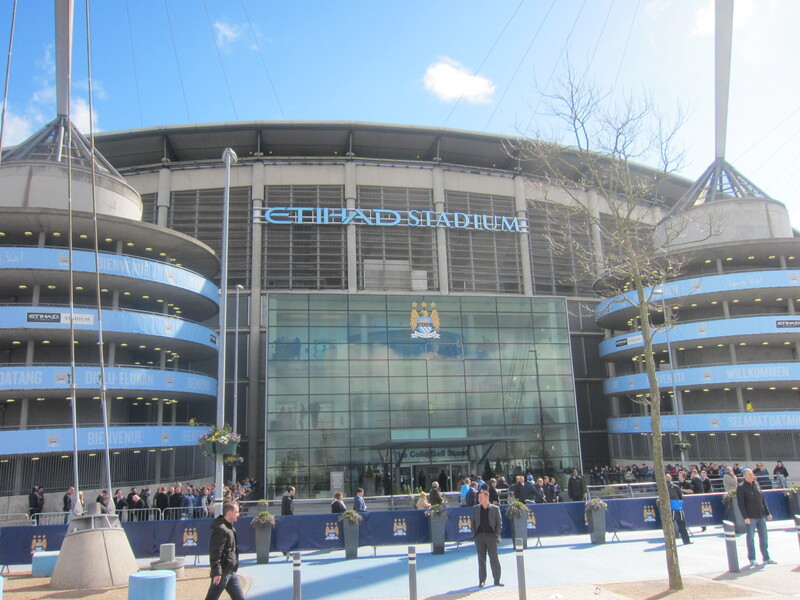 THREE years ago, maybe less, it was the centre of England’s football universe, but as 2015-16 draws to a close, supporters of both Manchester United and City will consider the season a failure – even if United win the FA Cup. United desperately need a trophy this year to end three years without a single bauble. City, although making steady progress in the UEFA Champions League, will have to be content with winning the Football League Cup for the second time in three years. United have endured three average years – by their standards – in the Premier, City have declined since their 2014 triumph. Given the money being paid out in Manchester, the supporters will surely feel the return on investment should be better. For those that get all bent out of shape about the city of Manchester’s relative downturn, it should be recalled there was a time when neither United or City were accustomed to picking up silverware. United went from 1967 to 1993 without a title, City waited for 44 years between championships. And during the 1970s, 1980s and early 1990s, there were challenging times for both clubs. United, between 1977 and 1992, were nothing more than “good at cups”, while City experienced some very low times. But we live in different, more demanding, more impatient times. Manchester City, with their incredible clout in the transfer market, do not look as dynamic as they were a year ago. The recent 2-2 draw with equally fragile Arsenal, with all its highs and lows, highlighted just why teams like City, United and Arsenal have not been able to make a dent in Leicester City’s drive to the top. A lack of consistency and too little passion. City spent £140m in the summer of 2015, most of it going on Raheem Sterling, Kevin De Bruyne and Nicolas Otamendi. Sterling and De Bruyne have scored six goals apiece in the Premier. Sterling has been a disappointment since arriving at the Etihad, failing to live up to his enormous billing. City have been badly hit by injuries, but a club with such a wallet cannot use that as an excuse. People were talking about City’s vulnerable backline well before the halfway stage of the season, pointing to the ongoing fitness concerns about Vincent Kompany and the loss of effectiveness of Martin Demichelis. Of equal concern was that Yaya Toure, who is rumoured to be leaving the club, has looked heavy and less mobile this season and his eight goals in all competitions is his lowest haul since joining the club in 2010. City have conceded 40 goals in the Premier this season, just slightly more than 2014-15. It is actually the goals scored column that is significantly lacking in 2015-16. City have netted 70 goals in 37 Premier games, 13 less than last season, 32 down on 2013-14, 16 fewer than 2012-13 and 23 shy of 2011-12. So the lack of firepower is costing Manuel Pellegrini’s side dear and exposing an uncertain defence. A glance at the statistics underlines City’s diminishing returns. In 2011-12, City had three players scoring in double digits – Sergio Aguero (23), Edin Dzeko (14) and Mario Balotelli (13). Likewise, in 2012-13, Aguero, Dzeko and Carlos Tevez all netted 14. When City won the Premier a year later, Toure scored 20, Aguero 17 and Dzeko 16. Last season it was Aguero (26), David Silva (12) and Toure (10). This season, only Aguero has reached double figures in the league. This has clearly hampered City’s progress in 2015-16. Moreover, they have lost 10 games in the Premier and some of these defeats have been very significant: 1-4 at Spurs, 1-4 at home to Liverpool, 0-2 at Stoke, 1-3 at home to Leicester. City made a bad call in letting Edin Dzeko leave on loan to Roma. He may not have been the most cultured or consistent of players, but he gave them an attacking option they have been lacking. Too often City looked to run out of ideas this season. If City’s cutting edge has looked a bit blunt, United’s season has labored on, with manager Louis Van Gaal coming under pressure for his supposedly dull football. United are still trying to come to terms with reduced circumstances after their long period in the sun. A string of blank scoresheets earned LVG’s side a reputation for football that sent the crowd dozing, which being the type of guy that he is, moved him to spend too much time defending himself and denying United had become a long-ball team. Unfortunately for LVG, his post-match persona appears to be one of a man sitting in a very uncomfortable seat. He also has the air of a man who has just popped a sweet in his mouth and discovered it is a very sharp lemon. It hasn’t helped that “professional ex-Manchester United players” have constantly sniped from the sidelines, also failing to realise that the golden age of Salford is over. United’s goalscoring is woeful – just 46 goals in 37 games, but their defence is relatively solid, conceding only 34. Their top scorer is Anthony Martial with just 11. Martial cost £36m when United signed him from Monaco at the start of the season and he looks like a player that LVG, or his successor, can build the future United team around. Not so promising has been Memphis Depay, who has struggled to make his mark. But one can envisage a potent United attack in the future that includes Martial and youth product Marcus Rashford. LVG could get out of jail by winning the FA Cup, but if United miss-out on UEFA Champions League football again, you can imagine the men from the US will start to get twitchy and the odd banner trailing behind a light aircraft might be seen on the Salford skyline. People complain about the “United way” not being adhered to, which does resemble the way some people viewed Dave Sexton when he was in charge at Old Trafford. Sexton wasn’t so much a failure (four seasons finishing places of: 10th, 9th, 2nd, 8th), it was the lack of excitement and his apparent lack of charisma. In his last season, 1980-81, United scored just 51 goals in 42 games. Sexton’s problem was that he followed the gung-ho and expansive Tommy Docherty. Van Gaal’s obstacle is the shadow of Sir Alex, as it will be for every manager until United become as successful as they were under Ferguson. They may have to wait. At the root of both club’s problems are decisions being made around management. That might sound like “stating the ‘bleedin’ obvious” but they have the resources (yes, even United) to build title-winning teams. City’s biggest blunder was announcing that Pellegrini was to be replaced by Pep Guardiola far too early. The smoke from the Vatican should have been emerging this weekend, after the final games. City decided to reveal their plans in February, undermining Pellegrini and the entire squad. Why? Perhaps they were worried that Pep would be snapped up if they didn’t get his signature on a lucrative contract. I cannot imagine it was an idea coming out of the Allianz Arena in Munich. Premature announcements of this sort do nothing to motivate players and just cast the departing manager in the role of “dead man walking”. The ink’s dry now, but if City don’t do enough to join the UCL bandwagon, what will Guardiola make of it all? As for United, LVG was never seen as a long-term appointment. It was made out of the desperate need to regain some stability after the Moyes experiment went haywire. LVG was a big name, a conservative choice, but United were warned that it might not be an ideal marriage. Did LVG have a chance, though? If the Ferguson factor and the Class of ‘92’s Statler & Waldforf stance wasn’t enough, he has the Jose Mourinho – will he, won’t he? – debate raging in the wings. Neither Pellegrini or Van Gaal have looked as though they have enjoyed managing their respective clubs, but then City and United don’t look like they are especially happy with their lot this year – there doesn’t seem to be much in the way of joie de vivre about either club. City’s tepid display against Real Madrid seemed to suggest they felt they’d done enough by getting to the last four. They didn’t even dent Real’s armour. United’s FA Cup final appearance will come as little consolation if they go without UCL football again, and it is either City or United – not both – that will achieve that goal. For City, failure to reach the UCL will be a major setback for a club craving acceptance at the highest level. Although it has been half a decade since Middle Eastern money elevated the club into the very top bracket, they desperately need success on the European stage, in much the same way Chelsea coveted it. The financial element may not be as important to City as it is to United. Their status is higher than City’s, regardless of recent performance, but the income streams that the UCL brings cannot be dismissed so easily. United, third in the Deloitte Money League 2016, saw revenues fall by 9% in 2014-15, largely due to an absence of European football. It has been three seasons since United’s luminosity started to wane, surely they cannot afford a fourth or fifth term in the wilderness? Moving into next season, the Premier is looking a more democratic landscape than it has been for a while. We have learned this year that the price differential of a player is greater than the difference in ability. I am sure that United and City officials are looking at their wage bill and transfer fees and wondering how you can spend so much and get it so wrong. Leicester set a new benchmark for the Premier, but the sad part of this is that the response of clubs like City and United will be to throw even more money at re-establishing their position at the pinnacle of the game. There’s no guarantee that will work, as we’ve seen in 2015-16, but you can rest assured, they will be back at some point.